Background: Neuroinflammation and oxidative stress mediated by microglial activation have been reported to play a critical role in the pathogenesis of neurodegenerative diseases. Therefore, inhibition of microglial activation using herbal medicine may be a potential candidate for the treatment of such diseases. Objective: The goal of this study was to investigate the anti-inflammatory and anti-oxidative effects of Centella asiatica extract (CA) on lipopolysaccharide (LPS)-stimulated BV2 microglial cells. Methods: BV2 microglial cells were treated with LPS in the presence or absence of CA extract. The levels of nitric oxide (NO), tumor necrosis factor-α (TNF-α) and reactive oxygen species (ROS) was measured using Griess reagent assay, enzyme-linked immunosorbent assay (ELISA) assay and CM-H2DCFDA, respectively. The nuclear levels of nuclear factor kappa B (NF-kB) p65 were detected using immunofluorescence and ELISA assay. Results: CA treatment resulted in significant and concentration-dependently reduced the LPS-induced production of NO, TNF-α, and ROS compared to the untreated group. CA treatment exerted an anti-inflammatory effect by suppressing NF-kB p65 translocation and the activation of Akt and the extracellular-signal-regulated kinase 1/2 (ERK1/2) pathway in LPS-stimulated BV2 cells. Conclusion: Taken together, these results show that CA exerts antioxidative activity by suppressing ROS production and that it exerts anti-inflammatory activity by suppressing LPS-induced NO and TNF-α production in BV2 microglial cells. These effects may occur through inhibition of Akt and the ERK1/2-mediated NF-kB pathway. The results presented here, coupled with traditional therapeutic claims, suggest that CA may be beneficial for treating neurodegenerative diseases mediated by microglial cells. Abbreviations used: AD: Alzheimer's disease; ALS: Amyotrophic lateral sclerosis; CA: Centella asiatica; DMSO: Dimethyl sulfoxide; DMEM: Dulbecco's modified Eagle's medium; ECL: Enhanced chemiluminescence; ELISA: Enzyme-Linked immunosorbent assay; ERK1/2: Extracellular-signal-regulated kinase 1/2; FBS: Fetal bovine serum; LPS: Lipopolysaccharide; MS: Multiple sclerosis; MSU: Mahasarakham University; NF-kB: Nuclear factor kappa B; NO: Nitric oxide; PD: Parkinson's disease; ROS: Reactive oxygen species; SD: Standard deviation; TNF-α: Tumor necrosis factor-α. This study aimed to explore the antiinflammation and anti-oxidative effects of Centella asiatica (CA) extract in lipopolysaccharide (LPS)-stimulated BV2 microglia cells. CA dose-dependently inhibited the production of nitric oxide, tumor necrosis factor-α, and reactive oxygen species that were induced by LPS. CA treatment exerted an anti-inflammatory effects by suppressing nuclear factor kappa B p65 translocation and the activation of Akt and the extracellular-signal-regulated kinase 1/2 pathway in LPS-stimulated BV2 cells. Neuroinflammation and oxidative stress play a critical role in the pathogenesis of a number of neurodegenerative diseases, such as Alzheimer's disease (AD), multiple sclerosis (MS), amyotrophic lateral sclerosis (ALS), and Parkinson's disease (PD).,,, Accumulating evidence shows that microglia, the resident immune cells of the central nervous system (CNS), also play an important role.,,,, Although acute microglial activation is generally beneficial because it tends to diminish further injury and contributes to the repair of damaged tissues,, chronic activation of microglial cells endangers neuronal survival through the release of various proinflammatory molecules and neurotoxins such as nitric oxide (NO), proinflammatory cytokines such as tumor necrosis factor alpha (TNF-α), and interleukin 1 beta (IL-1β) as well as the production of reactive oxygen species (ROS).,, Therefore, attenuation of microglial activation is considered a valuable strategy in the prevention and treatment of neurodegenerative diseases. Centella asiatica (L.) Urban (CA), commonly known as Gotu Kola, is a plant belonging to the family Apiaceae (Umbelliferae). It is native to the Southeast Asian countries as well as South Africa and Madagascar. The major chemical compounds found in this plant are triterpene saponosides. Furthermore, several flavonoids have been reported in CA including quercetin, rutin, apigenin, kaempferol, patuletin, castillicetin, castilliferol, and myricetin., A number of pharmacological properties of CA have been demonstrated, such as antiulcer,, cytotoxic and antitumor,, antiviral, antibacterial, antioxidant,, and anti-inflammatory activities. Neuroprotective effects have been demonstrated in several models including protection of cholinergic neurons from the toxic effects of aluminum and prevention of the cognitive deficits that occur following treatment with streptozotocin. In addition, CA has been shown to decrease protein carbonyl production in the brains of aged rats, to accelerate nerve regeneration, to attenuate the neurobehavioral and neurochemical effects of stroke, and to protect against oxidative neurotoxicity. Although the several pharmacological beneficial effects of CA have recently been reported, its molecular mechanisms on microglial activation have not yet been elucidated. Therefore, this study aimed to investigate the effects CA extract on the production of proinflammatory mediators, proinflammatory cytokines, and ROS as well as the transcription factor that regulates proinflammatory gene expression. The molecular mechanisms of the effect of CA on lipopolysaccharide (LPS)-stimulated BV2 microglial cells were also investigated. Since quercetin is one of the biologically active compounds present in CA, we investigated the effects of quercetin also. Quercetin, LPS, 3-(4, 5-Dimethylthiazol-2-yl)-2, 5-diphenyltetrazolium bromide) (MTT), and dimethyl sulfoxide (DMSO) were purchased from Sigma (St. Louis, MO). The Griess reagent kit was from Molecular Probes (Eugene, OR). The BCA protein assay kit, chemiluminescence, and nitrocellulose membranes were obtained from Pierce (Rockford, IL, USA). The ROS detection kit was from Calbiochem (La Jolla, CA). Antibodies against p-nuclear factor kappa B (NF-kB) p65 (Ser563), total- and p extracellular signal-regulated kinase 1/2 (ERK 1/2), total- and phosphor (p)-Akt, were from Santa Cruz Biotechnology (Santa Cruz, CA, USA). The enzyme-linked immunosorbent assay (ELISA) kit (TNF-a) and the NFkB p65 ELISA kit were from Abcam (Cambridge, UK). NE-PER nuclear protein extraction kit was from (Pierce Biotechnology Inc., Rockford, IL). Finally, Dulbecco's modified Eagle's medium (DMEM), penicillin-streptomycin, fetal bovine serum (FBS), and all of the other cell culture reagents were from Hyclone (South Logan, UT). Edible leaves of CA were collected in June 2016 at Udon Thani province and identified by an Applied Thai Traditional Medicine practitioner at Mahasarakham University (MSU) Faculty of Medicine. A specimen (MSUT-7231) was deposited at MSU Faculty of Science Herbarium. A total of 0.25 kg of sliced and dried CA leaf was extracted twice with 50% ethanol (1 L) at room temperature for 7 days. Next, the extract was filtered, evaporated, lyophilized, and stored in a freezer until used. The yield was 8.75% of the starting dry weight of the leaves. The extract was standardized using colorimetric methods, with total phenolic content determined as 28.31 ± 3.42 mg/g of dried extract (using gallic acid as a standard), and total flavonoid content determined as 9.82 ± 3.15 mg/g (using rutin as a standard). The BV2 microglial cell was kindly provided by Professor James R Connor, Neurosurgery, Penn State Hershey Medical Center. The BV2 microglial cell was cultured in DMEM supplemented with FBS (5%) containing penicillin (100 units/mL)/streptomycin (100 μg/mL) and 1% L-glutamine in 75 cm2 flasks. The flasks cells were maintained in a humidified incubator (at 37°C, 95% air, and 5% CO2). BV2 cells were cultured in 96-well plates (1 × 104 cells/well). After overnight incubation in a 5% CO2 incubator at 37°C, cells were exposed to CA at concentrations ranging from 0 to 300 μg/ml in the presence or absence of LPS. After 24 h of treatment, the potential cytotoxicity of CA was evaluated by MTT assay as previously reported. Briefly, the medium was removed and replaced with serum-free medium containing MTT reagent at a final concentration 0.5 mg/mL. Cells were incubated at 37°C with 5% CO2. After 2 h of incubation, the supernatant was removed, DMSO was added, and absorption was measured at 570 nm. BV2 cells were seeded in 96 well plates (1 × 104 cells/well). Cells were then maintained overnight in a 5% CO2 incubator at 37°C. After overnight incubation, the medium was removed from each well and replaced with serum-free medium containing 1 μg/ml LPS with/without the concentrations of CA or quercetin. NO levels were measured after 24 h of treatment, using Griess reagent according to the method described previously. BV2 cells were seeded in 24 well plates (1 × 105 cells/well). After 24 h of treatment, supernatants were collected to determine TNF-α levels by ELISA kits according to the manufacturer's instructions. BV2 cells were seeded in 96 well plates (1 × 104 cells/well). Cells were then maintained overnight in a 5% CO2 incubator at 37°C. The intracellular ROS was determined after 24 h of treatment using CM-H2DCFDA as previously reported. After treatment (24 h), cells were washed with PBS and lysed in lysis containing protease and phosphatase inhibitor cocktail. The concentrations of protein were calculated using a protein assay kit (BCA). Twenty micrograms of protein were separated on SDS polyacrylamide gels and transferred onto nitrocellulose membranes. After that, the blots were blocked for 1 h at room temperature. The blots were incubated overnight at 4°C with primary antibodies against Akt, p-Akt, β-actin, ERK1/2, and p-ERK1/2. After washing, blots were incubated with HRP-conjugated secondary antibody. The membrane-bound antibody was detected with an enhanced chemiluminescence detection reagent. BV2 cells were plated in 24 well plates (5 × 104 cells/well). Cells were then maintained overnight in a 5% CO2 incubator at 37°C. After 24 h of treatment, the NF-kB nuclear translocation was performed by immunofluorescence staining according to previously reported. BV2 cells were plated in 25 mm flasks (5 × 105 cells/well). After 24 h of treatment, cells were harvested with a cell scraper and lysed with the NE-PER nuclear protein extraction kit to obtain nuclear and cytosolic fractions. The quantity of NF-kB in the nuclear fractions was determined using an ELISA kit as described in a previous study. All data were expressed as the mean ± standard error of the mean (SEM) from at least three independent experiments performed in triplicate. Statistical analysis was performed using one-way ANOVA followed by Bonferroni post-tests. Statistical significance was considered at the P < 0.05. To determine the potential cytotoxic effects of CA extract on BV2 cells, cells were treated with various concentrations (0–300 μg/ml) of CA with/without of LPS (1 μg/ml). After 24 h of treatment, cell viability was evaluated by MTT assay. As shown in [Figure 1]a, treatment with CA alone or with LPS was nontoxic against BV2 cells at the above concentrations compared with the untreated control. The vehicle used to dissolve CA, 0.1% DMSO, did not affect cell viability either as determined by MTT assay (data not shown). Therefore, low non-cytotoxic concentrations (50, 100, and 200 μg/ml) of CA were used in this study. NO is an inflammatory mediator secreted by microglial cells during activation. To determine the effect of CA on NO production induced by LPS, the Griess reagent assay was used. As shown in [Figure 1]b, the stimulation of cells with LPS induced a significant increase in NO production from the basal level of 10.86 ± 0.067–43.07 ± 0.87 μM. Co-treatment with CA effectively and concentration-dependently inhibited its induction, and complete inhibition was observed at 200 μg/ml. As with CA treatment, treatment with quercetin (12 μM) significantly suppressed LPS-induced NO production [Figure 1]b.
Microglial activation also produces TNF-α, a proinflammatory cytokine which has been reported to damage neuronal cells. In this study, the inhibitory effects of CA on TNF-α production in BV2 microglial cells was investigated using an ELISA assay. 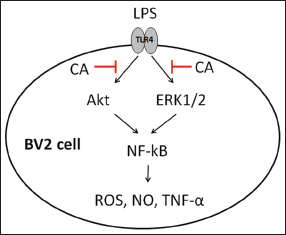 As shown in [Figure 2]a, TNF-α production significantly increased in LPS-stimulated BV2 cells compared with that in the control group (approximately 31-fold). As expected, cotreatment with CA (50, 100, and 200 μg/ml) reduced the TNF-α production by approximately 2.5, 3.5, and 10-fold, respectively. 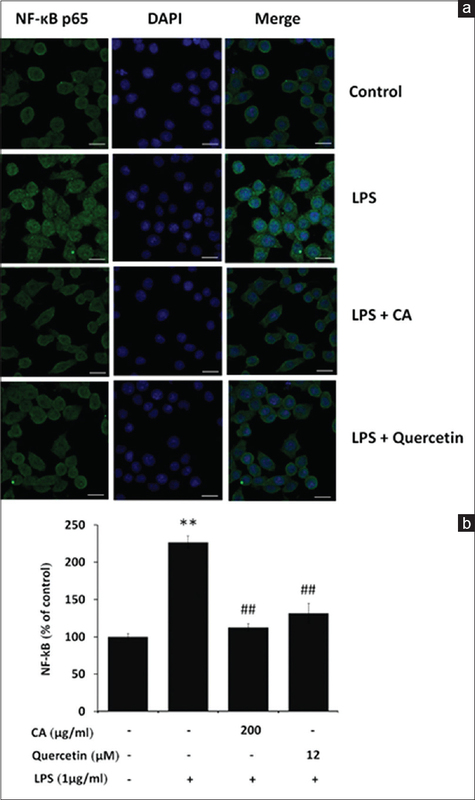 Consistent with the inhibitory effects of CA, quercetin treatment markedly reduced LPS-induced TNF-α production. However, a high concentration of CA decreased TNF-α production more than quercetin treatment. Activated microglia are known to generate ROS, which can induce tissue damage and inflammation. We, therefore, investigated whether CA inhibits ROS production in LPS-stimulated BV2 cells. The results show that stimulation of BV2 cells with LPS caused a 3.6-fold increase in cellular ROS production, as compared with the untreated control group. CA treatment with LPS blocked this induction significantly and concentration-dependently, returning ROS production to levels seen in the control group. ROS production also decreased significantly after treatment with quercetin [Figure 2]b. This effect was statistically similar to CA treatment. NF-kB is a key transcriptional factor that regulates the expression of a large number of genes involved in the inflammatory process. We investigated the inhibitory effect of CA in LPS-mediated activation of NF-kB. In this study, the quantity of NF-kB p65 subunit in the nuclei of LPS-treated cultures of BV-2 microglia was determined by immunofluorescence staining assays and ELISA assays. As shown in [Figure 3]a, immunofluorescence microscopy revealed that NF-kB/p65 was mainly localized in the cytoplasm of control BV-2 microglia. Stimulating BV-2 microglia with LPS increased the nuclear localization of NF-kB p65. The NF-kB/p65 in the nuclei of LPS-treated of BV-2 microglia was found to decrease following treatment with CA or quercetin, indicating that CA and quercetin treatment inhibits NF-kB activation in BV2 microglial cells. As with the results from the immunofluorescence assay, the ELISA demonstrated that after LPS treatment, nuclear NFkB p65 protein level was significantly increased compared with that in untreated control group. Interestingly, CA treatment (200 μl/ml) significantly decreased NF-kB nuclear localization compared within the LPS-stimulated microglia [Figure 3]b. It is well known that the Akt signaling pathway plays a critical role in the regulation of NF-κB activation. We next investigated the effects of CA on the phosphorylation of Akt proteins in LPS-stimulated BV2 cells using western blot analysis. A high level of Akt phosphorylation was observed in LPS-treated cells. However, treatment with 200 μg/ml of CA significantly inhibited LPS-induced Akt phosphorylation [Figure 4]a. We also investigated the inhibitory effects of CA on the phosphorylation of ERK1/2 protein. As shown in [Figure 4]b, LPS stimulation significantly induced ERK1/2 phosphorylation. Intriguingly, CA treatment markedly reduced LPS-induced ERK1/2 phosphorylation. 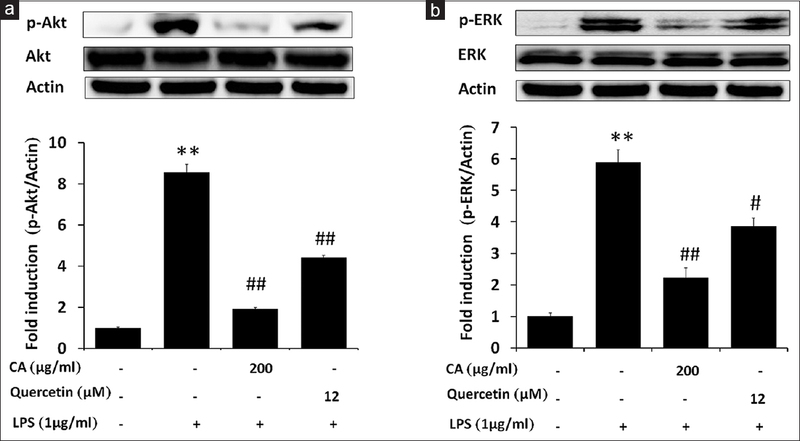 Quercetin treatment also significantly inhibited LPS-induced Akt [Figure 4]a and ERK1/2 [Figure 4]b phosphorylation. In contrast, the levels of nonphosphorylated Akt and ERK1/2 were unchanged by either LPS or CA treatment. Neuroinflammation and oxidative stress mediated by microglial activation have been implicated in the development of pathology of neurodegenerative diseases. Therefore, the inhibition of microglia-activated inflammation is an important strategy for the prevention and treatment of these diseases. In the current study, we demonstrated that CA could inhibit microglial activation by attenuation of NO, TNFα, and ROS production through the NF-kB-mediated PI3K/Akt and ERK signaling pathways. During microglial activation, NF-kB is a key transcription factor that regulates the expression of proinflammatory cytokines as well as ROS to trigger a self-perpetuating process resulting in progressive neuronal damage. Under non-stimulated conditions, NF-kB is kept inactive by the inhibitory IkB protein in the cytoplasm. In response to proinflammatory stimuli, IkB is phosphorylated leading to its ubiquitination and subsequently degradation leading to the release of NF-kB, permitting its translocation to the nucleus where it promotes the expression of genes that are involved in the production of proinflammatory cytokines. It is well known that the PI3K/Akt signaling pathway plays a critical role in the regulation of NF-kB activation in activated microglia. Inhibition of the PI3K/Akt/NF-kB signaling pathway in microglial cells can also suppress the expression of proinflammatory cytokines., Therefore, drugs or medicinal plants that inhibit the PI3K/Akt/NF-kB signaling pathways could be a promising medication for the treatment of neuroinflammatory diseases. As a result, we found that CA suppressed the LPS-induced nuclear translocation of the NF-kB/p65 subunit in BV2 microglia, suggesting that CA inhibits the production of NO, TNF-α, and ROS by inhibiting the nuclear translocation of NF-kB. In addition, Akt phosphorylation in LPS-stimulated BV2 microglial cells was also markedly reduced by CA, suggesting that CA inhibits LPS-induced NF-kB activation by suppressing the PI3K/Akt signaling pathway. In addition to Akt, several pieces of evidence suggest that mitogen-activated protein kinases (MAPKs) including ERK1/2, JNK, and p38 are important signaling molecules that play a role in proinflammatory cytokine expression. Among the three classes of MAPK, ERK1/2 has been reported to regulate TNF-α expression in LPS- or interferon-γ -stimulated microglial cells. ERK1/2 has also been reported to regulate NF-kB activity. Therefore, a further experiment was performed to determine whether CA regulates ERK1/2 activation in LPS-stimulated BV2 cells. The results reveal that treatment with LPS induced ERK1/2 phosphorylation in BV2 microglia, and that CA markedly reduced this phosphorylation. However, the amount of nonphosphorylated ERK1/2 was unaffected by CA or LPS treatment, suggesting that CA also reduced proinflammatory response mediated by LPS- through the inhibition of ERK1/2 activation in BV2 microglia. Therefore, inhibition of the NF-kB, PI3K/Akt and ERK signaling pathways in microglial cells as a result of CA may result in the reduction of proinflammatory mediators, cytokines, and ROS, resulting in an anti-inflammatory effect. In this study, we also demonstrated that quercetin (a flavone derivative present in CA) significantly inhibited the production of NO and TNF-α and ROS in LPS-activated BV2 microglial cells. These results are consistent with reports that quercetin inhibits LPS-induced NO, TNF-α, and ROS production in BV2 microglial cells,,, and suggestive of NF-kB/Akt and ERK1/2 pathway inhibition. It has also been reported that the CA constituent, madecassic acid, exerts anti-inflammatory activity by downregulating iNOS and COX-2 expression and release of TNF-α, IL-1β, and IL-6 through downregulation of NF-κ B activation in RAW264.7 macrophage cells. Our results also suggest that the ability of CA to inhibit LPS-induced NO and TNF-α and ROS inflammatory responses through the NF-kB/PI3K/AKT and ERK1/2 signaling pathways in BV2 cells might be due to the presence of quercetin and madecassic acid. Taken together, our results demonstrate that CA significantly attenuates release of NO, TNF-α as well as ROS in LPS-stimulated BV2 microglia. The inhibitory effects of CA were accompanied by the prevention of nuclear translocation of NF-kB. This was associated with inactivation of the PI3K/AKT and ERK1/2 signaling pathway [Figure 5]. These results indicate that CA, at non-toxic concentrations, exerts its anti-inflammatory and anti-oxidative effects by inhibiting NF-kB activation and the PI3K/AKT and ERK1/2 signaling pathways. The data presented in this study suggest that CA may be a promising candidate for treating of neurodegenerative diseases that are related to microglial activation. The authors would like to thank Dr. Tim Cushnie at MSU Faculty of Medicine for language-editing assistance. This research was financially supported by grants from Mahasarakham University (MSU; grant year 2018), the National Research Council of Thailand, and MSU Faculty of Medicine. Kim YS, Joh TH. Microglia, major player in the brain inflammation: Their roles in the pathogenesis of Parkinson's disease. Exp Mol Med 2006;38:333-47. Polazzi E, Monti B. Microglia and neuroprotection: From in vitro studies to therapeutic applications. Prog Neurobiol 2010;92:293-315. Hailer NP. Immunosuppression after traumatic or ischemic CNS damage: It is neuroprotective and illuminates the role of microglial cells. Prog Neurobiol 2008;84:211-33. Mirshafiey A, Jadidi-Niaragh F. Prostaglandins in pathogenesis and treatment of multiple sclerosis. Immunopharmacol Immunotoxicol 2010;32:543-54. Lambertsen KL, Clausen BH, Babcock AA, Gregersen R, Fenger C, Nielsen HH, et al. Microglia protect neurons against ischemia by synthesis of tumor necrosis factor. J Neurosci 2009;29:1319-30. Imai F, Suzuki H, Oda J, Ninomiya T, Ono K, Sano H, et al. Neuroprotective effect of exogenous microglia in global brain ischemia. J Cereb Blood Flow Metab 2007;27:488-500. Rogers J, Mastroeni D, Leonard B, Joyce J, Grover A. Neuroinflammation in Alzheimer's disease and Parkinson's disease: Are microglia pathogenic in either disorder? Int Rev Neurobiol 2007;82:235-46. Boje KM, Arora PK. Microglial-produced nitric oxide and reactive nitrogen oxides mediate neuronal cell death. Brain Res 1992;587:250-6. Chao CC, Hu S, Peterson PK. Glia, cytokines, and neurotoxicity. Crit Rev Neurobiol 1995;9:189-205. Pan J, Kai G, Yuan C, Zhou B, Jin R, Yuan Y, et al. Separation and determination of madecassic acid in triterpenic genins of Centella asiatica by high performance liquid chromatography using beta-cyclodextrin as mobile phase additive. Se Pu 2007;25:316-8. Matsuda H, Morikawa T, Ueda H, Yoshikawa M. Medicinal foodstuffs. XXVII. Saponin constituents of gotu kola (2): Structures of new ursane- and oleanane-type triterpene oligoglycosides, centellasaponins B, C, and D, from Centella asiatica cultivated in Sri Lanka. Chem Pharm Bull (Tokyo) 2001;49:1368-71. Subban R, Veerakumar A, Manimaran R, Hashim KM, Balachandran I. Two new flavonoids from Centella asiatica (Linn.). J Nat Med 2008;62:369-73. Cheng CL, Koo MW. Effects of Centella asiatica on ethanol induced gastric mucosal lesions in rats. Life Sci 2000;67:2647-53. Cheng CL, Guo JS, Luk J, Koo MW. The healing effects of centella extract and asiaticoside on acetic acid induced gastric ulcers in rats. Life Sci 2004;74:2237-49. Lee YS, Jin DQ, Kwon EJ, Park SH, Lee ES, Jeong TC, et al. Asiatic acid, a triterpene, induces apoptosis through intracellular Ca2+release and enhanced expression of p53 in HepG2 human hepatoma cells. Cancer Lett 2002;186:83-91. Bunpo P, Kataoka K, Arimochi H, Nakayama H, Kuwahara T, Bando Y, et al. Inhibitory effects of Centella asiatica on azoxymethane-induced aberrant crypt focus formation and carcinogenesis in the intestines of F344 rats. Food Chem Toxicol 2004;42:1987-97. Yoosook C, Bunyapraphatsara N, Boonyakiat Y, Kantasuk C. Anti-herpes simplex virus activities of crude water extracts of thai medicinal plants. Phytomedicine 2000;6:411-9. Zaidan MR, Noor Rain A, Badrul AR, Adlin A, Norazah A, Zakiah I, et al. In vitro screening of five local medicinal plants for antibacterial activity using disc diffusion method. Trop Biomed 2005;22:165-70. Jayashree G, Kurup Muraleedhara G, Sudarslal S, Jacob VB. Anti-oxidant activity of Centella asiatica on lymphoma-bearing mice. Fitoterapia 2003;74:431-4. Bajpai M, Pande A, Tewari SK, Prakash D. Phenolic contents and antioxidant activity of some food and medicinal plants. Int J Food Sci Nutr 2005;56:287-91. George M, Joseph L, Ramaswamy AS. 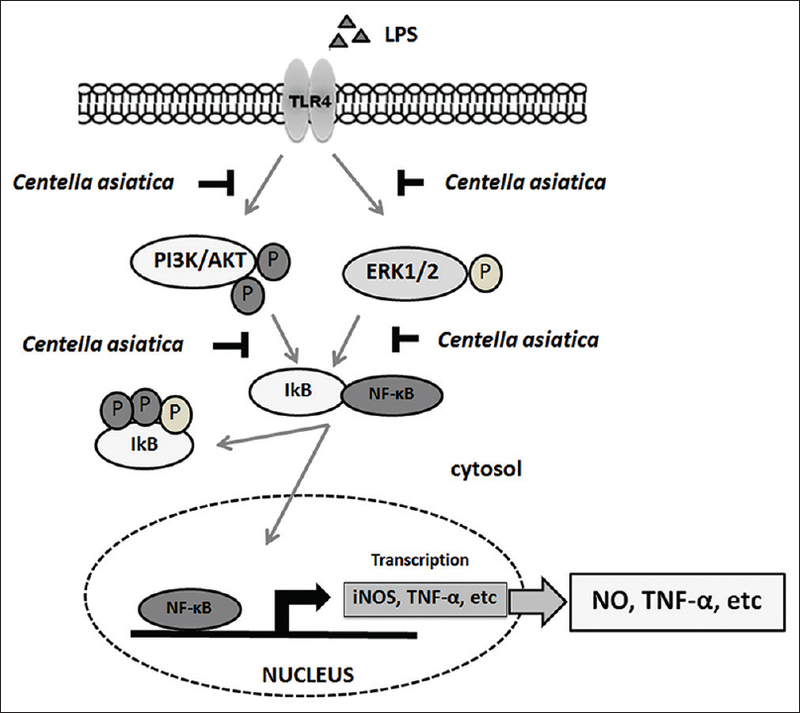 Anti-allergic, anti-pruritic, and anti-inflammatory activities of Centella asiatica extracts. Afr J Tradit Complement Altern Med 2009;6:554-9. Veerendra Kumar MH, Gupta YK. Effect of Centella asiatica on cognition and oxidative stress in an intracerebroventricular streptozotocin model of Alzheimer's disease in rats. Clin Exp Pharmacol Physiol 2003;30:336-42. Subathra M, Shila S, Devi MA, Panneerselvam C. Emerging role of Centella asiatica in improving age-related neurological antioxidant status. Exp Gerontol 2005;40:707-15. Soumyanath A, Zhong YP, Gold SA, Yu X, Koop DR, Bourdette D, et al. Centella asiatica accelerates nerve regeneration upon oral administration and contains multiple active fractions increasing neurite elongation in vitro. J Pharm Pharmacol 2005;57:1221-9. Tabassum R, Vaibhav K, Shrivastava P, Khan A, Ejaz Ahmed M, Javed H, et al. Centella asiatica attenuates the neurobehavioral, neurochemical and histological changes in transient focal middle cerebral artery occlusion rats. Neurol Sci 2013;34:925-33. Haleagrahara N, Ponnusamy K. Neuroprotective effect of Centella asiatica extract (CAE) on experimentally induced parkinsonism in aged sprague-dawley rats. J Toxicol Sci 2010;35:41-7. Mairuae N, Cheepsunthorn P. Valproic acid attenuates nitric oxide and interleukin-1β production in lipopolysaccharide-stimulated iron-rich microglia. Biomed Rep 2018;8:359-64. Mairuae N, Cheepsunthorn P, Louicharoen Cheepsunthorn C, Tongjaroenbuangam W. Okra (Abelmoschus esculentus linn) inhibits lipopolysaccharide-induced inflammatory mediators in BV2 microglial cells. Trop J Pharm Res 2017;16:1285-92. Tak PP, Firestein GS. NF-kappaB: A key role in inflammatory diseases. J Clin Invest 2001;107:7-11. Mulrennan SA, Redington AE. Nitric oxide synthase inhibition: Therapeutic potential in asthma. Treat Respir Med 2004;3:79-88. Cau SB, Carneiro FS, Tostes RC. Differential modulation of nitric oxide synthases in aging: Therapeutic opportunities. Front Physiol 2012;3:218. Park JH, Choi JY, Son DJ, Park EK, Song MJ, Hellström M. Anti-inflammatory effect of titrated extract of Centella asiatica in phthalic anhydride-induced allergic dermatitis animal model. Int J Mol Sci 2017;18. pii: E738. Guo JS, Cheng CL, Koo MW. Inhibitory effects of Centella asiatica water extract and asiaticoside on inducible nitric oxide synthase during gastric ulcer healing in rats. Planta Med 2004;70:1150-4. Hartog A, Smit HF, van der Kraan PM, Hoijer MA, Garssen J.In vitro and in vivo modulation of cartilage degradation by a standardized Centella asiatica fraction. Exp Biol Med (Maywood) 2009;234:617-23. Jiao J, Xue B, Zhang L, Gong Y, Li K, Wang H, et al. Triptolide inhibits amyloid-beta1-42-induced TNF-alpha and IL-1beta production in cultured rat microglia. J Neuroimmunol 2008;205:32-6. Talley AK, Dewhurst S, Perry SW, Dollard SC, Gummuluru S, Fine SM, et al. Tumor necrosis factor alpha-induced apoptosis in human neuronal cells: Protection by the antioxidant N-acetylcysteine and the genes bcl-2 and crmA. Mol Cell Biol 1995;15:2359-66. Choi MJ, Zheng HM, Kim JM, Lee KW, Park YH, Lee DH. Protective effects of Centella asiatica leaf extract on dimethylnitrosamineinduced liver injury in rats. Mol Med Rep 2016;14:4521-8. Naidoo DB, Chuturgoon AA, Phulukdaree A, Guruprasad KP, Satyamoorthy K, Sewram V, et al. Centella asiatica modulates cancer cachexia associated inflammatory cytokines and cell death in leukaemic THP-1 cells and peripheral blood mononuclear cells (PBMC's). BMC Complement Altern Med 2017;17:377. Mittler R. Oxidative stress, antioxidants and stress tolerance. Trends Plant Sci 2002;7:405-10. Shinomol GK, Muralidhara. Effect of Centella asiatica leaf powder on oxidative markers in brain regions of prepubertal mice in vivo and its in vitro efficacy to ameliorate 3-NPA-induced oxidative stress in mitochondria. Phytomedicine 2008;15:971-84. Chen CL, Tsai WH, Chen CJ, Pan TM. Centella asiatica extract protects against amyloid β1-40-induced neurotoxicity in neuronal cells by activating the antioxidative defence system. J Tradit Complement Med 2016;6:362-9. Gray NE, Zweig JA, Matthews DG, Caruso M, Quinn JF, Soumyanath A. Centella asiatica attenuates mitochondrial dysfunction and oxidative stress in Aβ-exposed hippocampal neurons. Oxid Med Cell Longev 2017;2017:7023091. Dhanasekaran M, Holcomb LA, Hitt AR, Tharakan B, Porter JW, Young KA, et al. Centella asiatica extract selectively decreases amyloid beta levels in hippocampus of Alzheimer's disease animal model. Phytother Res 2009;23:14-9. Lee JY, Jhun BS, Oh YT, Lee JH, Choe W, Baik HH, et al. Activation of adenosine A3 receptor suppresses lipopolysaccharide-induced TNF-alpha production through inhibition of PI 3-kinase/Akt and NF-kappaB activation in murine BV2 microglial cells. Neurosci Lett 2006;396:1-6. Mankan AK, Lawless MW, Gray SG, Kelleher D, McManus R. NF-kappaB regulation: The nuclear response. J Cell Mol Med 2009;13:631-43. Lee YH, Jeon SH, Kim SH, Kim C, Lee SJ, Koh D, et al. Anew synthetic chalcone derivative, 2-hydroxy-3',5,5'-trimethoxychalcone (DK-139), suppresses the toll-like receptor 4-mediated inflammatory response through inhibition of the akt/NF-κB pathway in BV2 microglial cells. Exp Mol Med 2012;44:369-77. Kyriakis JM, Avruch J. Mammalian mitogen-activated protein kinase signal transduction pathways activated by stress and inflammation. Physiol Rev 2001;81:807-69. Dang Y, Xu Y, Wu W, Li W, Sun Y, Yang J, et al. Tetrandrine suppresses lipopolysaccharide-induced microglial activation by inhibiting NF-κB and ERK signaling pathways in BV2 cells. PLoS One 2014;9:e102522. Simonyi A, Chen Z, Jiang J, Zong Y, Chuang DY, Gu Z, et al. Inhibition of microglial activation by elderberry extracts and its phenolic components. Life Sci 2015;128:30-8. Sun GY, Chen Z, Jasmer KJ, Chuang DY, Gu Z, Hannink M, et al. Quercetin attenuates inflammatory responses in BV-2 microglial cells: Role of MAPKs on the nrf2 pathway and induction of Heme oxygenase-1. PLoS One 2015;10:e0141509. Won JH, Shin JS, Park HJ, Jung HJ, Koh DJ, Jo BG, et al. Anti-inflammatory effects of madecassic acid via the suppression of NF-kappaB pathway in LPS-induced RAW 264.7 macrophage cells. Planta Med 2010;76:251-7.